In 1975 Porsche’s circumstances were strikingly similar to what they had been in 1965: Essentially, at both times, the company needed to think fast to appease a loyal segment of their market, and at both times they met this challenge by installing the engine of a bowing model into the body of a 911. Specifically, 1975 marked the end of the line for the mid-engined 914, however its successor, the water-cooled 924, would not be ready until 1977, and so to close this gap Porsche applied the same formula that had worked so well in 1965: By mating the VW-based 1,971cc Type IV engine that had first been introduced in the 1973 914 2.0, into a second generation G-series 911 chassis that had first been introduced in the 1973 911, Porsche created the 1-year only 1976 912E. Compared to the last original series 912 made in 1969, the 1976 912E incorporated several advancements that Porsche had made in those seven years. Perhaps most notably, for 1976 the factory began zinc coating the basic chassis unit, although due to limited availability not all cars received exactly the same treatment. According to PCA's Upfixin' the Porsche, galvanization of Porsche floorpans and other panels began well before the 1976 model year, but early series cars are argued to have been treated only up to the roofline. The galvanization along with a switch to high-quality Theissen steel is said to have made the 1976 model year and on cars very resistant to corrosion if properly cared for. Other 912E upgrades include prominent energy-absorbing bellows bumpers, an innovation designed to meet the latest U.S. safety standards, as well as three-point seat belts and integrated headrests as standard equipment. Although the motor for the 912E was essentially the same what came in the 914 2.0, it came equipped with a new unique fuel injection system that reportedly "took Porsche engineers two years to develop and refine”. The Bosch L-Jetronic fuel injection system used is often referred to as the Air Flow Controlled (AFC) system allowed the 912E to produce 90 HP at 4,900rpm, yet due to a low compression of ration of 7.6:1 it could run on regular gasoline. The exhaust gas recirculating system had to be checked every 30,000 miles and a warning light indicated this. The Bosch L-Jetronic fuel injection system was so effective, that it was later adapted for use in the 911 series. Incidentally, he “E” in 912E stands for “Einspritzer” which is the German word for fuel injection. The prototype 912E was car #911 520 1617, and it first ran as a test car (without legal registration) on May 15th, 1975. After being legally converted for road use by Porsche (by adding proper lights, KPH Speedometer, etc.) it was sold to Dr. Berndt Bergk who had direct connections to Porsche’s Director of Research and Development, Helmut Bott. The car was first registered for road use on November 12, 1976, and then driven regularly until 2005. Since 2005 the car has resided in the Prototyp Auto Museum in Hamburg, Germany. 912E production commenced by May, 1975, with options that included electric sunroof, ATS “Cookie Cutter” alloy wheels, limited 923/02 slip differential, air conditioning, and 27 standard colors. Thanks to 912 Registry member and 912E enthusiast Aric Gless, who took it upon himself to create a database that tracks every 912E he has ever encountered, much is known about the state of 912Es in the world today. According to Aric’s notes, about half of all 912Es made came equipped with a sunroof. It is rumored that Porsche could have made a 912E Targa, but so far no examples have ever been verified. According to Aric’s research, there were between 2,080 and 2,100 912Es manufactured, of which over half are still on the road today. The 912E was exclusively intended for the North American market, where rising fuel prices and lowered U.S. speed limits helped make the 912E a very practical model. With a 21 U.S. gallon fuel tank and fuel-efficient engine, the 912E's 600-plus mile driving range may be the best of any Porsche ever made to date. Air cooled technology authority Jake Raby has stated that “The 912E is the best all around, daily driver Porsche that was ever built!” Despite only being sold in the U.S., today many 912Es have been imported back into Europe. When production ended in June, 1976, the 912E proved to be Porsche's last air-cooled four-cylinder production car. Tanner Foust is a world champion drift and rally car racer, a Hollywood stunt driver, the host of American Top Gear and a proud 912E owner. The following interview was first published in the Spring 2011 issue of 912 Registry Magazine. Could you begin by telling us a bit about who you are & what you do? I am a pre-med student turned racecar driver and have made a living behind the wheel for the last 15 years. I truly love to drive whether it’s a Zonda or a tractor and have been lucky enough to race professionally in several disciplines including rally, road racing, Pikes Peak, Baja and drifting. I also sell my soul to the TV world regularly for the opportunity to drive the world best and worst cars on Battle of the Supercars and the US version of Top Gear. How did your love for cars begin? My interest in cars started the first time i felt my dad accelerate out of a corner in anger. It was a sunny morning and we were making the right hand sweeper from Denver’s Colorado Blvd to Hampton St. in the 912E. I had never seen my Dad turn in so quick and the tires squealed all the way through the turn. He calmly complained of low tire pressure after the corner, i think to diffuse the story i’d be telling my mom later, but the hook was in deep; i loved the feeling. I remember the smell of that day, the tug of speed on my inner ear and the gear shift lever buried into the seat cushion in it’s classic second gear position just before finding third after the corner exit. I was 5 years old and drooled over that yellow 912e from then on. What is your first memory of your father’s E? One winter my Dad, step mother, sister and I packed our ski’s on the 912’s rack and our ski gear in every other available nook to make the drive from Denver to Steamboat (3 hours). I was probably 3 or 4 at the time and still remember being a bit offended at the tiny hole that was carved out for me to sit in amidst the roof-high stack of jackets and boots. The car had snow’s put on it every year and was a great runner to the slopes. I need to find that ski rack! What are some other favorite memories you associate with your E? Does your E have any special or unique features or additions? My 912e is as it was from the factory inside and out except for a CIS injection from a BMW 318 that was installed to deal with some start/run issues in the Colorado winters. It has a sunroof, is yellow (or some version of gold) with camel interior and has a strange blaupunk audio recording microphone for recording notes on tape that was a factory option. What do you use your E for today? Today the 912E is my breakfast, cars ‘n coffee, first nice day of spring--runner. It fires right up and while dwarfed by most cars (read SUV’s) on the Orange County freeways, it’s actually very comfortable at the typical 80 mph weekend flow. Given all the amazing cars you have access to, what, to you, is special or unique about the E? There’s obviously something unique about a car that you’ve grown up with. There are the phases and an evolution of my perception of this car. At a young age i thought it was the greatest, fastest car in the world, but then as i got older i realized it could be one of the slowest cars Porsche ever made. It was not the supercar i once thought and it had faults but it was still a family member. Now, slightly older my dad’s old 912e has a different meaning to me. I appreciate it for what it is and for the time in history when it was on the sharper end of the pyramid. It also reminds me a time in my history; It was a good childhood and i respect my pops for taking the time to celebrate a nice sunny day with a crisp drive. That sounds a bit mushy but it’s amazing how the smell of a car can conjure so many memories. And now that smell is in my garage. 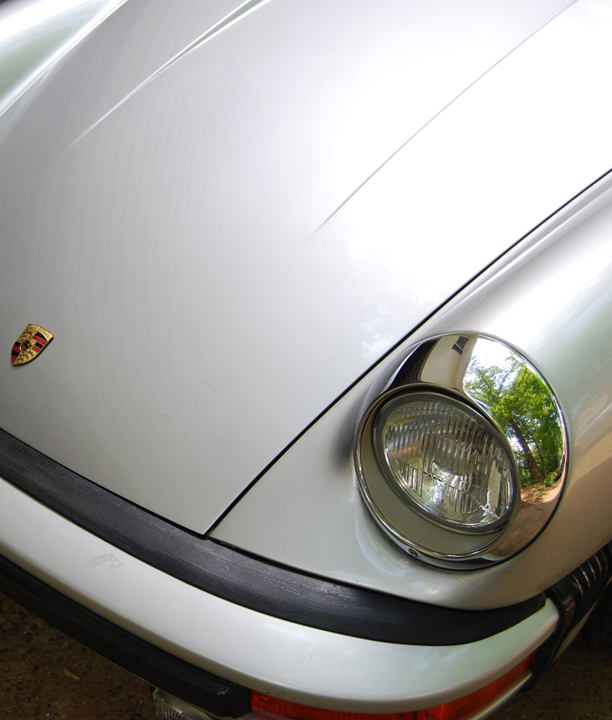 Have you ever driven an early (1965-1969) 912? If so, what did you think? I never have but i’ve alway liked the way they sat on the road: low and simple. What might the future hold for you and your E? I’ll leave my car ridiculously original (save the injection.) I think there will be a set of springs to bring it to a more european looking and handling height but otherwise i’ll just try to keep improving the little blemishes of age without pulling the character.